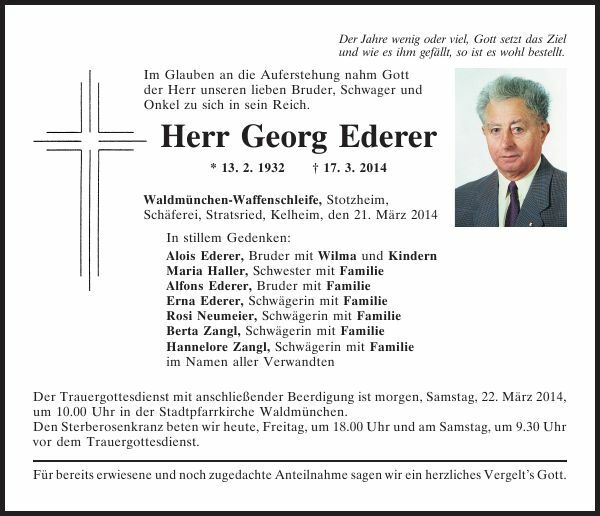 Georg Ederer was born on February 13, 1932, in Stratsried, Kreis Cham, Bavaria, Germany, the son of Alois Ederer and Maria Schmid. He attended school in Biberbach from 1938 to 1946. From 1947 to 1950, he was trained as a carpenter in Hochabrunn, and in 1958 passed an examination in Munich to become a master carpenter. He worked as a technical draftsman in Regensburg, at a construction firm in Munich, a building department in Dachau, then later for the Board of Works in district offices of the counties Waldmuenchen and Cham, retiring in 1992. On February 8, 1961, he married Theresia Zangl, in Munich. They built a home in Waffenschleife (a suburb of Waldmuenchen) in 1985. Georg became interested in family history in 1973 when he accompanied a cousin to the parish office at Ast. He was intrigued by the information in the church records, caught the "genealogy bug" and started researching his own ancestors. In 1985, he began volunteer work at the Waldmuenchen parish archives. He was able to read the difficult German and Latin script which Catholic priests wrote in baptism, marriage, and death records in the county of Waldmuenchen (later Cham) and surrounding counties. Using this information, he constructed family trees (also known as pedigrees). He also researched property owners of area Bavarian villages and created maps. His work became known to Americans (who were mostly from the area of Plain, Sauk County, Wisconsin, but also from other states in America) who hoped to find out more about their ancestors in Bavaria, Germany. 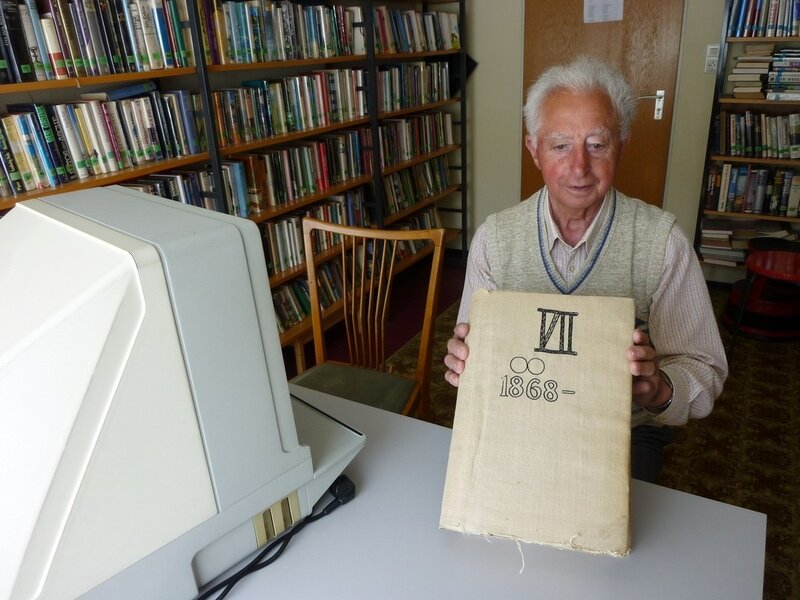 Georg was happy to help and volunteered his time, spending many long hours reading church records and constructing family trees. Many of his trees were handwritten on long scrolls; others were typewritten. His personal library grew with each family he researched, and an entire room in his home was used to store his works. Georg was very devoted to this "hobby." In July 1996 and May 2005, Georg and his wife Resi took trips to Wisconsin to visit some of the families for whom he did research. He proudly distributed genealogy scrolls and patiently explained the material he created. Georg's research was the bridge that connected these descendants of American immigrants to their distant relatives in their ancestral homelands in Bavaria. Groups of people from both countries visited each other over the years. In Bavaria, Georg was able to show Americans in which village or home their ancestors lived. For the Americans, it was a very emotional experience to see the land where their ancestor's came from. Georg was happy to be a part of this experience. In 2011, after nearly 40 years of research, his family trees relating to American emigrants (about 10% of his works) were scanned and made available for purchase on a DVD entitled, "Genealogies of families that immigrated to Sauk County, Wisconsin, from Bavaria, Germany: The collected works of Georg Ederer, Otto Horz, and Hansjörg Schneider." The DVD is available by contacting the Old Franklin Township Historical Society in Plain, Wisconsin. More about Georg Ederer's life can be found in the introduction booklet on the DVD. Although he preferred not to be the focus of attention, the authors of the DVD honored Georg Ederer on October 16, 2012, at the city hall in Waldmuenchen in an official presentation of the DVD to the mayor of Waldmuenchen, at which time they showed their appreciation for the many years of Georg's work. 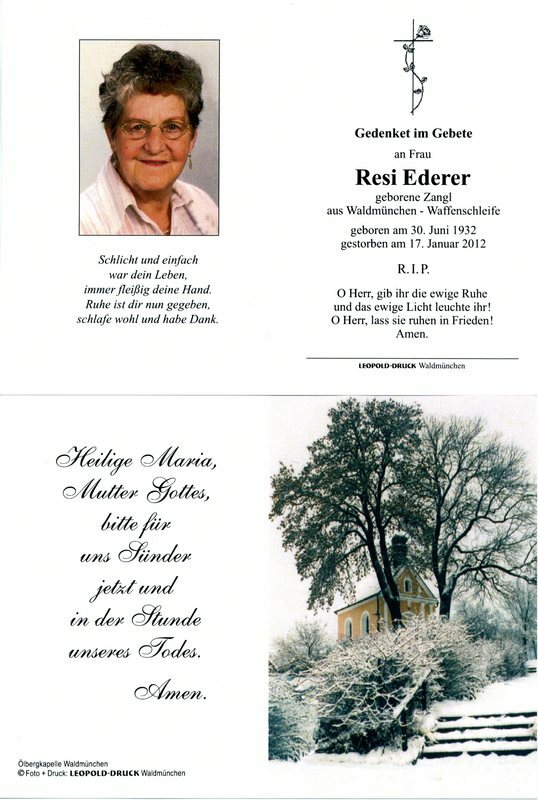 Georg's beloved wife, Resi, died on January 17, 2012, in a Straubing hospital. He continued to keep busy with requests from people wanting to know more about their history, and up until his last day on earth, Georg was constructing pedigrees. 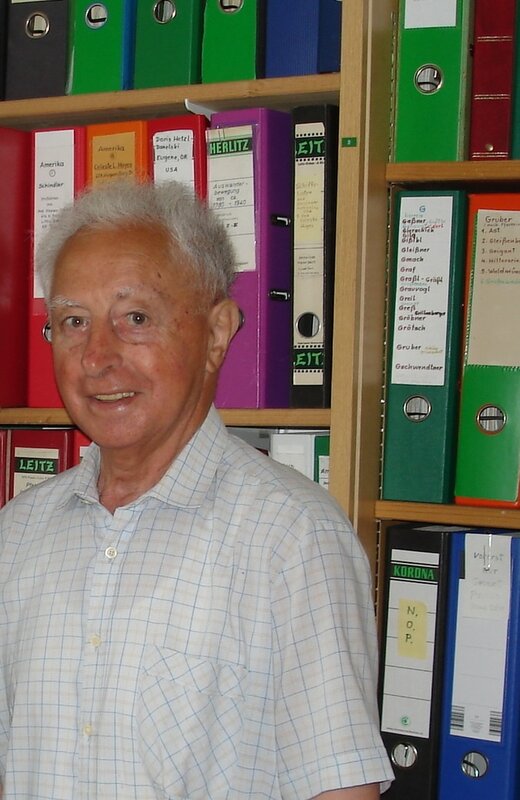 He passed away unexpectedly on March 17, 2014, at a hospital in Regensburg - the city where he spent many hours researching at the Catholic church archive. 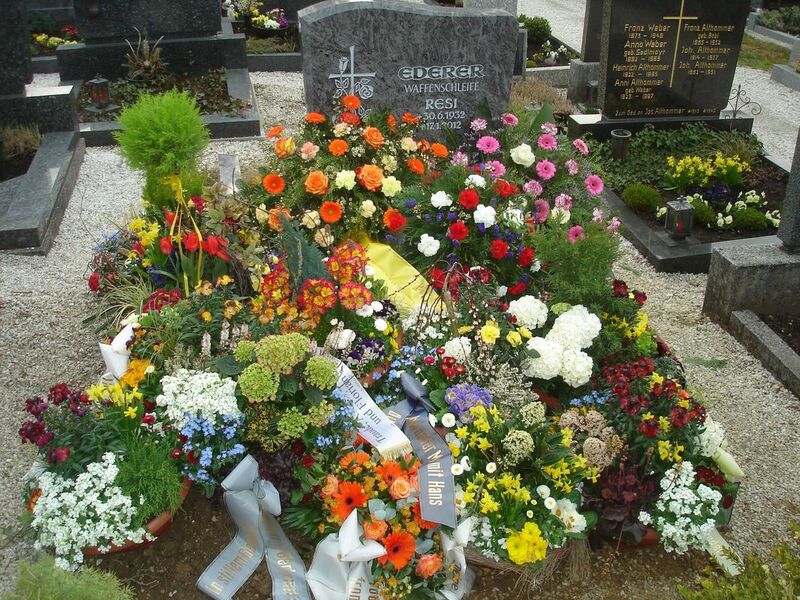 Burial was on March 22, 2014, at the cemetery in Waldmuenchen. He was survived by two brothers, one sister, and nieces and nephews. We encourage everyone to continue Georg's work. Update your family trees. Share what you know with others. Write a family history. 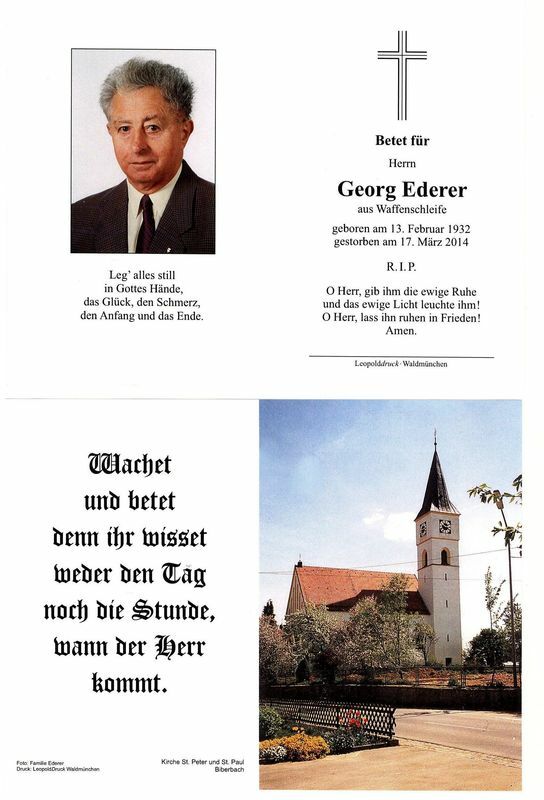 Thank you, Georg Ederer! May you rest in peace. Portrait, Bayerwald Echo and Chamer Zeitung newspapers, March 21, 2014. Georg Ederer in his home, June 21, 2012; photo by Georg J. Blau. Cemetery photo by Debbie Blau on March 22, 2014. Funeral flowers decorating Georg's grave. Georg in his research library. To learn more about the DVD mentioned in this tribute click on the button at the right. Whether your age is young or old, God sets the destination how he pleases, so it is surely ordered. Believing in the resurrection, God our Lord took our dear brother, brother-in-law and uncle into his Kingdom. The funeral service followed by burial will be tomorrow, Saturday, March 22, 2014, at 10 o'clock in the Waldmuenchen city church. We will pray the rosary today, Friday at 6 pm, and on Saturday at 9:30 am before the funeral service. For your thoughts and sympathy, we say a heartfelt God bless you. Thank you to Debbie Blau for contributing the above material. 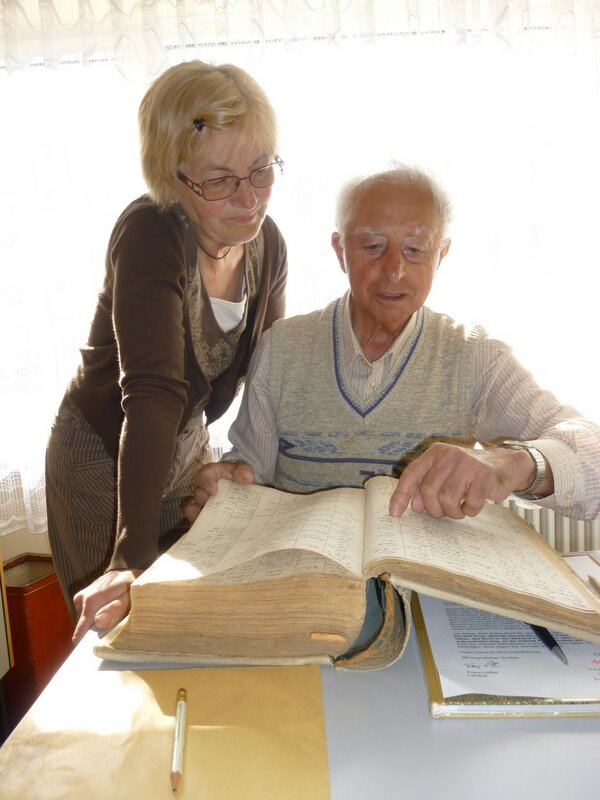 Christa Senft and Georg Ederer researching in the parish archive for Marian Ruhland Burmester's Weiss relatives in May of 2012. 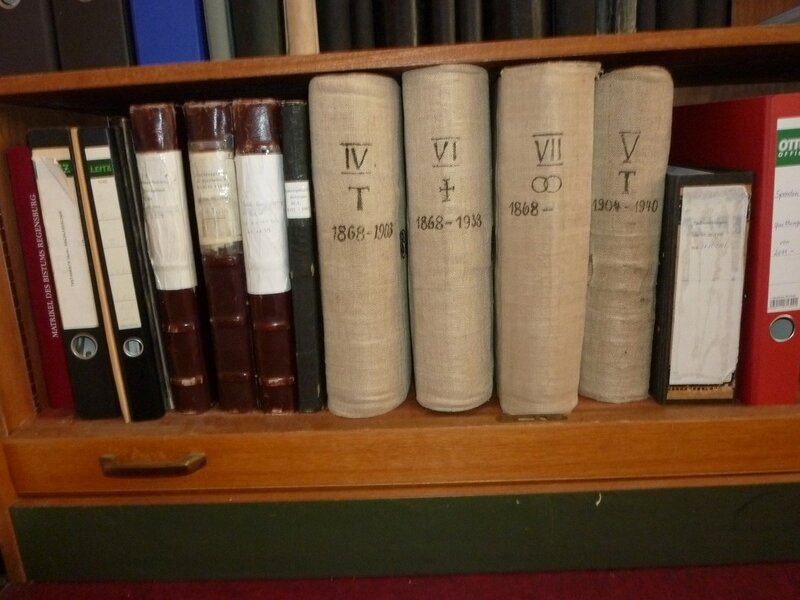 Georg found marriage records for two daughters of Anton and Barbara Weiss. Photos taken by Willi Senft. Willi and Christa Senft are very dear friends of Georg. Christa has done most of the translation between the Americans and Germans whether it is a letter requesting genealogy research or when visiting the two different countries.